← Watching The Wire last night. I have owed you some pictures for a while now. This relates to a ceremony held in Thabisa’s village, Corana, just the other side of Mthatha. Thabs and her cousin Mazwi had both been dreaming regularly of their great-grandmother who died, aged 105, a few years ago. It was clear to Thabs and Mazwi (and everyone else) that a ceremony was called for. It took place around new year. I have delayed writing about it because I have not been sure how to handle it. It is difficult for me to relate these things without coming across disrespectful. Because, in spite of the fact that I don’t believe any of the superstitious or religious stuff, I love the people who do. Mid-December, when the planning starts to really get underway I ask if the butcher will cut the carcass up or whether we will take it whole. Thabs gives me a look. “Gail, the sheep must be alive.” Of course. I knew that. But I didn’t actually relate it to our sheep. 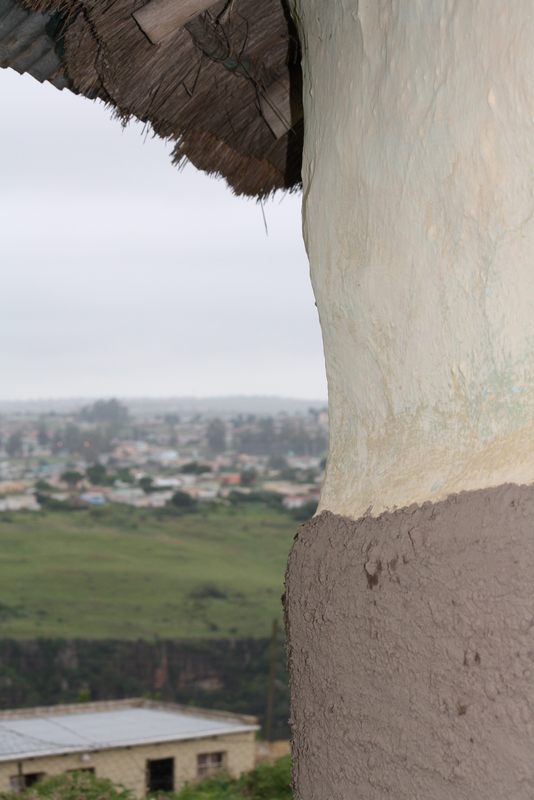 Close-up of her great-grandmother’s house, where Thabisa and I slept. Mthata in the background. “It will fit fine in the boot. The guys will tie its legs together – they are good at it. We can stop in Butterworth to give it some water”. We bought the sheep in Mthatha and Thabisa’s cousin, Dali, took it in a venter trailer attached to a taxi to Corana. It was maaaarginally more expensive than it would have been in East London. For the ancestors: umqombothi, gin, impepho, tobacco and snuff. Thabs and I slept that night in her great-granny’s bedroom, with the carcasses of two sheep (Mazwi bought one too) on the floor beside us. 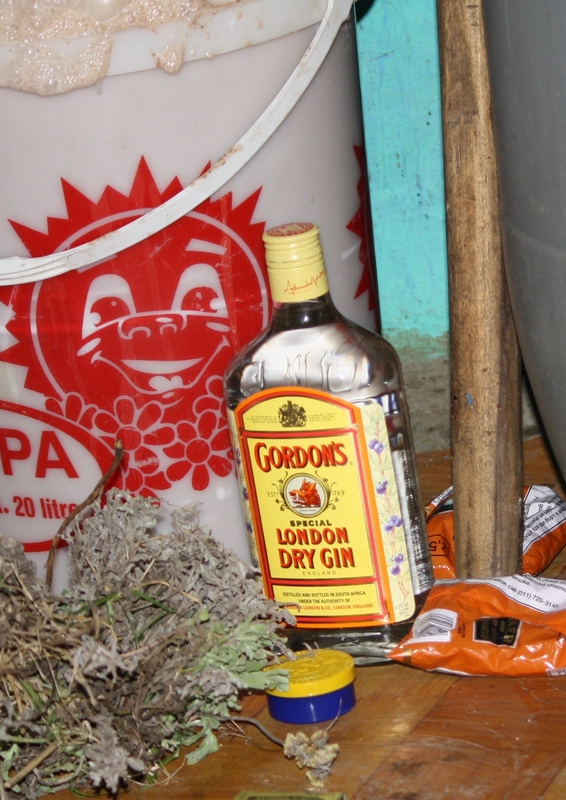 On the other side of that, next to barrels of umqomboti (Xhosa beer), were the gin and tobacco and bunches of impepho – a herb burnt to drive away evil spirits and to communicate with the ancestors. 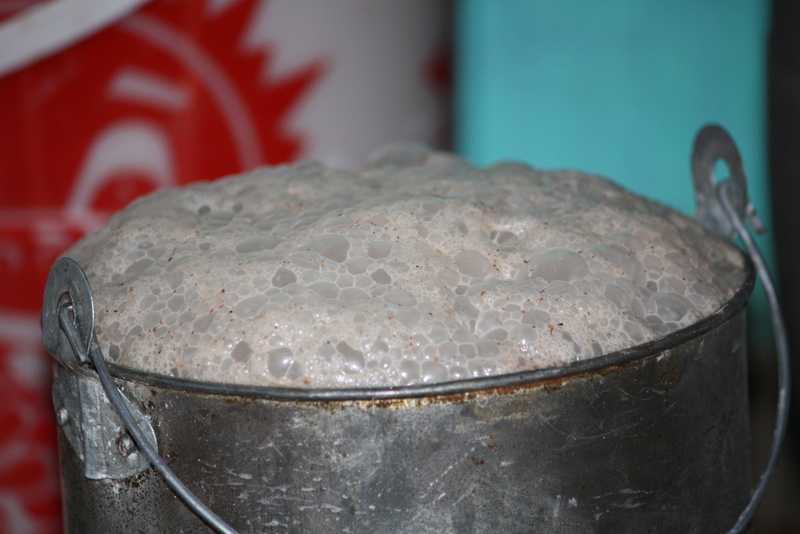 The yeasty-meaty-impepho smells were almost over powering. Thabs slept like a baby. I lay awake listening to the pop-pop-pop of umqomboti bubbling, and the buzzing of the flies and pondered the meaning of it all. Singing. Praying. Speeches. Laughter. Good meal. Big party. Thabisa was offered the job that she has been angling for for the past two years. This is a fact, but I am no way linking this to anything else in this post. 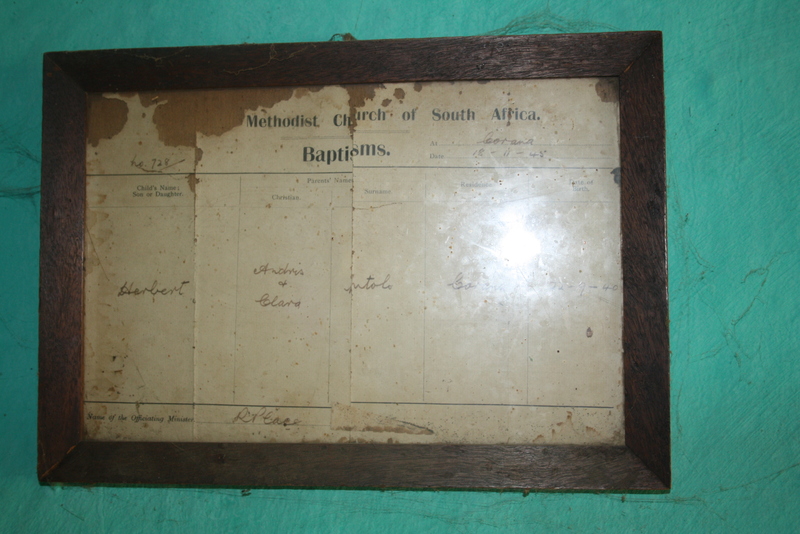 On the wall in Thabisa’s great-grandmother’s house, Herbert Mtolo’s baptism certificate. 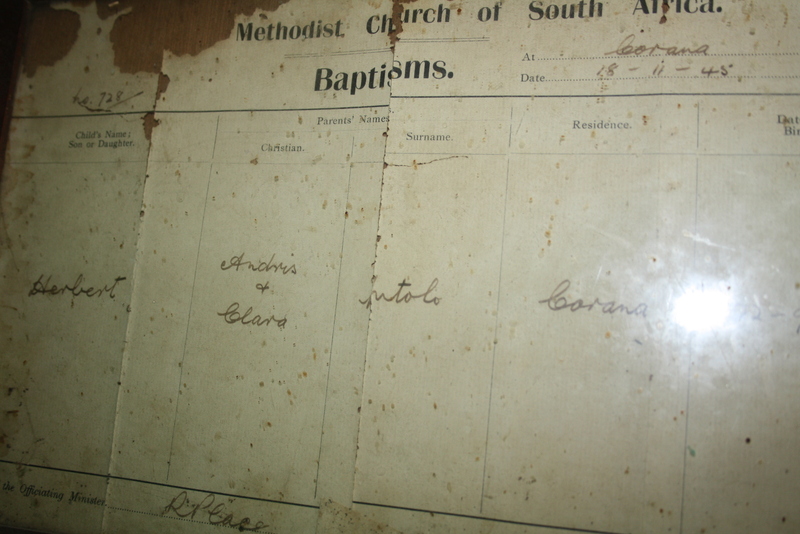 Baptism certificate, close-up. Herbert is Thabisa’s grand-father. It is his mother, Clara, that we honoured that day. This entry was posted in Uncategorized and tagged ancestors, Corana, Eastern Cape, impepho, sheep, superstition, Xhosa culture. Bookmark the permalink.